How could I not be inspired to write with the full force of my imagination and to be filled with romanticism when I have been fortunate to travel the world as a child? When I was ten years old my father "heard the voice of God" telling him to stop being a successful businessman and become a writer. We took off on a Pan Am flight for London, without a plan of where we were going, believing God would lead us, so that he could gain inspiration for his books. It was the turbulent 1960s and an American family of six was a rare site in many of the places we visited. 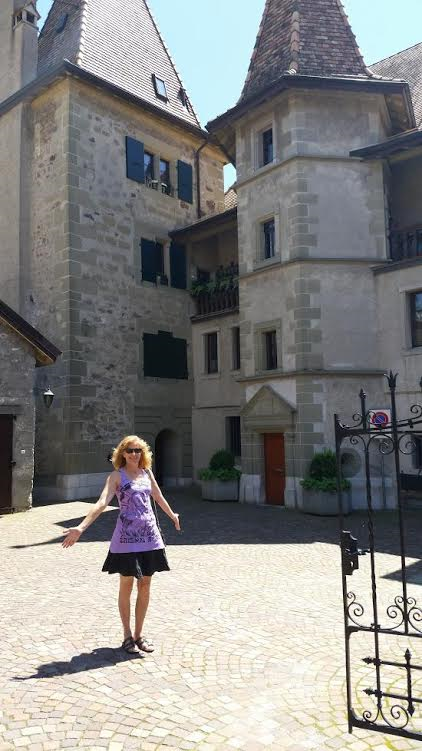 We escaped out of Egypt right before the 6 Day War, "smuggled" Bibles into communist countries and lived in a 17th century castle in Switzerland. All of this I am writing about in my childhood memoir, Into the World, for which I won the 2015 New Millennium Writings Nonfiction Award for an excerpt, 'Reflections from Istanbul." My father went on to become a highly successful conservative Christian writer and I was never able to fall in with his myopic view of the world--although I have always respected him for following his heart and never giving up on his dream of being a writer, That took great and it inspired me to do the same. 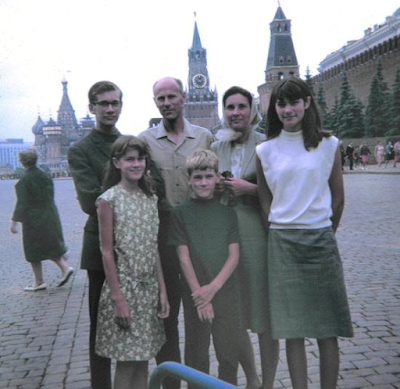 Here we are in Moscow in 1966. 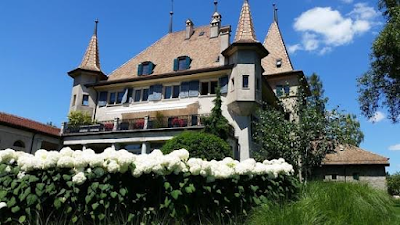 I suppose the highlight of my childhood was living in Chateau d'Echendens, outside of Lausanne, overlooking Lake Geneva. I mean, how can you beat that? I visited there last summer with my daughter and my niece, just to prove to myself that it really did happen. And yes, that castle existed! Because unlike strip malls in the United States, 17th century castles in Europe tend to stick around for well...centuries. In the "drawing room," there was an old painting of a man in formal dress. He was dark and brooding and stared straight out at me. As children, my sister, Janna, and I used to make up stories about him. He was a vampire who still lived today, and he haunted the dungeons down below. 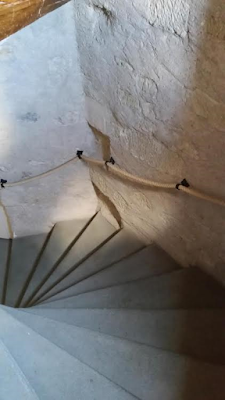 Yes, there were dungeons, although we were never allowed into them. How could I not end up writing about vampires and angels and demons and star-crossed lovers? How could I not, when I lived in such a magical place as a child? 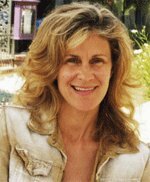 And, because I lived in a real castle, I was able to write about it from the perspective of someone who had felt those cold stone walls and breathed the air that was sucked up the winding staircase, walked on the old Persian carpets and sat in the rickety chairs. This I have started writing about in the second book in the Night Angels Chronicles, Book of Angels, when Sera is transported to the Night Angels' castle on a jagged rocky peak over-looking a lake in Slovenia. I won't tell you why she was taken there, but something terrible happens at the end of Key of Mystery to Sera and her brother, Salem, and the second book opens with Sera waking up in this castle. No more clues now! But check out this winding staircase. As an adolescent, this is where I walked up every day, after attending the village school, through a tiny wooden door, into this gothic and scary space, holding the ghosts of the past. Amazingly, I ended up living in Slovenia as an adult, during the communist era, when it was part o Yugoslavia. That is another tale to be told. It is still my second home and I visit with my daughter often. Thus, my inspiration for having one of the Night Angels come from this part of the world. If I believed in reincarnation, I would think I had lived here during the Ottoman Empire, and that, too, is part of the history of the Night Angels Chronicles. 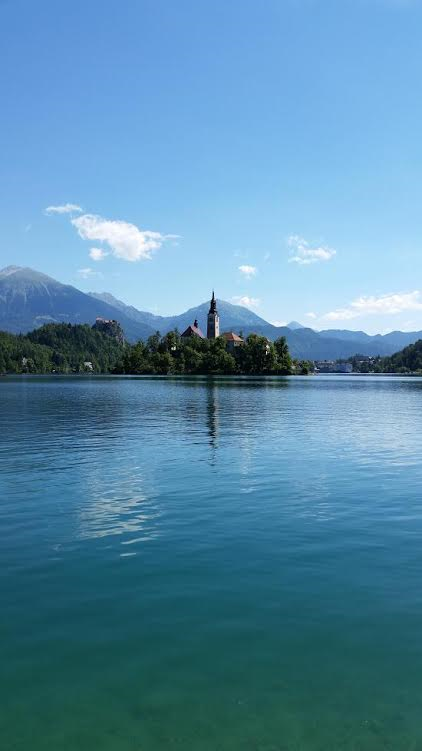 Professor Strejan, who you will meet in Key of Mystery, has his castle here, and on the island, beneath the church lies....well, I cant' really tell you what lies there, you will have to read about it for yourself. 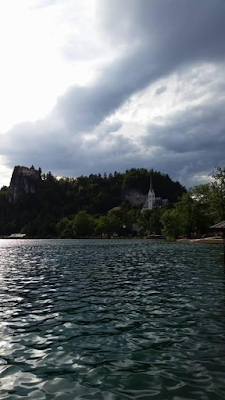 I love castles and medieval churches on islands and dark, winding pathways through forests. I have lived and breathed the air in these places and they are a part of m spirit. I am so thankful I can share these experiences through my stories. Sera's whole world is about to change. When her father dies under mysterious circumstances Sera wants to know what happened to him. He hasn't left his family anything but a black box. Inside is a key and Sera wears it around her neck. That's when she suddenly starts having horrible nightly encounters with awful creatures. Someone wants to harm her, but why? Does it have anything to do with her father's death? Sera thinks his disappearance might have something to do with a secret hidden beneath the city. Help comes from new people at Sera's school. They are there to protect her. That doesn't mean she can automatically trust them though. Do they act in her best interest? When almost all of her old friends suddenly dislike Sera because of what happened to her father she's in dire need of new friends. Fortunately she doesn't have to fight all of her battles on her own, but does that also mean that Sera will be all right eventually? 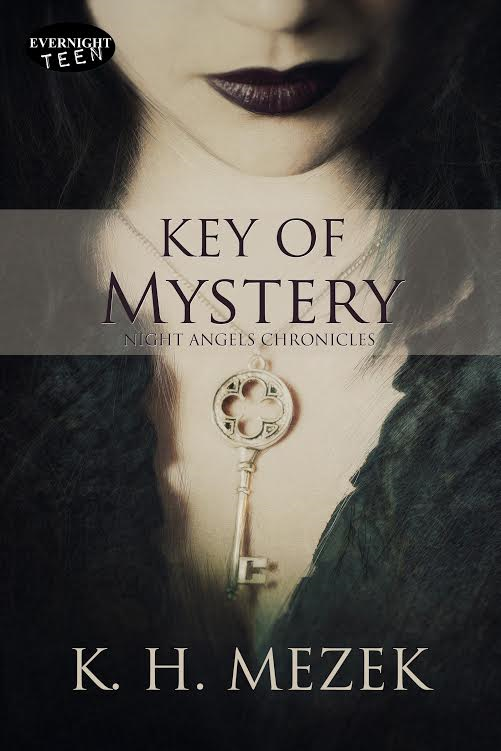 Key of Mystery is an interesting story about a fascinating key. I love the idea of a mysterious key that makes its wearer powerful. Sera is a great main character. Before her father's death she was spoiled, but she sees the world through different eyes after everything that happened to her. I enjoyed witnessing that transformation. She's often strong, but isn't afraid to show weakness either. She's fiercely loyal and cares about people. That also means that she wants to protect them at all costs. The book ends with a big cliffhanger and I can't wait to find out what will happen to her next. K.H. Mezek is a good writer. I liked her choice of supernatural characters and the idea of a secret chamber that can be opened with the special key. There are vampires in this story and there are also creepy zombies. If you enjoy reading supernatural stories you should definitely get this book. Question about the book: how did you come up with the names of the main characters? Hi Mai! Names of characters come to me in a kind of sudden rush. They just pop in my head and stay there and I can't get rid of them! If it is a name of someone who comes from a different country and culture then I will do some research as well. My name is Karen Hunt, and I am writing under the name KH Mezek because...well, that's a longer story than I can explain here! Thanks for the question! I would love to read this one. Strong female characters are a must for me. Excited to see what supernatural beings are in the book. Hi there! Thank you for your response. Glad you are excited by the characters! Nice pic. Love the cover. Thanks, Kim. I LOVE this cover. I didn't want to give away what Sera looks like, so just her lips are perfect! Everyone has a chance to create their own version of Sera in their minds! I love a book where the characters change their ways after a sad experience. It sounds awesome! Thanks, Judy. These characters, especially Sera, definitely have their share of hardships that they overcome! Wow! You lived in a castle, that's amazing! The books going to feel very realistic, I can just tell. I enjoyed reading the review. This book sounds interesting. Will definitely check it out. To author: Did you start by designing a key for the story? Is the one on the cover your design of the key? To blog host: Thanks for the review and posting on this wonderful story!